Our kitchens are also known as the heart of the home, a gathering place and center of daily activities. When you spend a lot of time in a room, it's easy to overlook the colors and decor that were so carefully chosen when you first decorated. Perhaps you're starting to notice that the kitchen looks a little tired, but you're not really ready to tackle a major kitchen makeover. How about a color makeover instead? With just a few of these easy color additions, you can skip the big makeover and fall in love with your kitchen all over again. It's no secret that adding paint will refresh any room. What if you added paint to an unexpected kitchen surface? The sides of a kitchen island, a backsplash, or even ceiling, could benefit from a fresh paint color. For a kitchen island, think of colors like mint green, pale aqua, or butter yellow. For a backsplash, you can go bold with poppy red or olive green. A ceiling can appear to float overhead with a soft sky blue or peach. Revving up your kitchen color can be as simple as adding a new rug. You may not think that a rug is a good match for the moisture-prone kitchen environment, but the latest indoor/outdoor area rugs are a great match for anything you dish out in there. Always be sure to choose the correct rug pad for your flooring type, in any room. At any given hour, your dinnerware is probably visible somewhere in your kitchen. If you'd like to refresh the color in your kitchen, updating your dinnerware to a more colorful set, is an easy fix. Many of us fell for the practical idea of buying neutral dinnerware because it would go with everything. This is a valid reason for purchasing plain dinnerware, but after a while it becomes invisible. Why not choose an accent color from a nearby room, or from a favorite kitchen linen, and buy a colorful new set of dishes? Better yet, you can also find new ways to keep your new dinnerware on display, not hidden in a cabinet. Kitchens can present a paint color challenge. With walls of cabinets, appliances, and open spaces, it can be hard to add an accent color. An easy and stylish way to add an accent wall color in the kitchen is to add the accent wall outside the kitchen. Choose a wall that is visible from the kitchen. The accent wall could be in a hall going through the kitchen, the far wall in an adjacent dining area, or even a mud room. A simple accent wall can mean a big injection of color for your kitchen. Choose a color that is right for the nearby room, but also picks up accent colors from the kitchen, too. 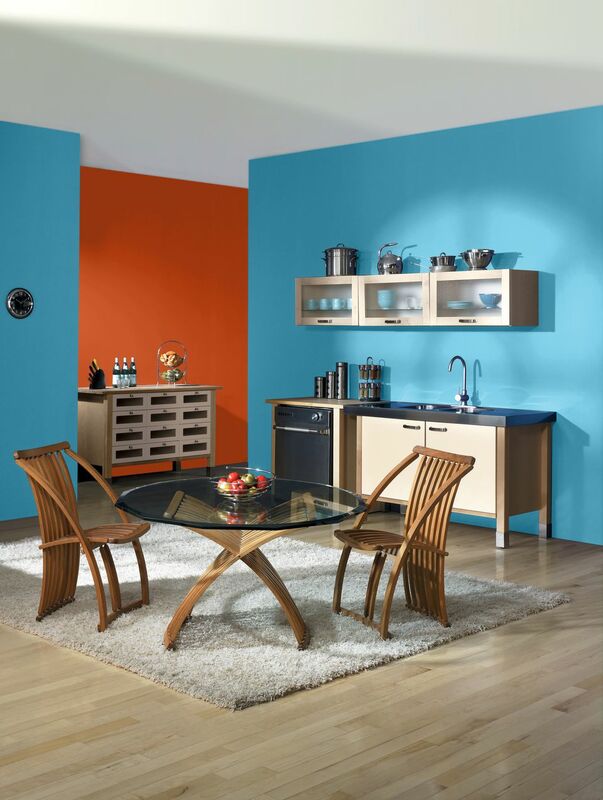 One of the most charming ways to add color to an kitchen, is to add painted furniture. A bookshelf, bench, or cabinet, added to the kitchen can personalize the space. When you use painted furniture, it adds even more character with a pop of color. Painted furniture is perfect for adding a color that you love, but wouldn't want to paint on every wall. Yes, you can add a colorful new light fixture without wiring anything. The new breed of plug-in chandeliers and pendants are gorgeous, and require only a standard plug and a ceiling hook. A plug-in chandelier is perfect for defining a new eating space, or a cozy corner in the kitchen for reading cookbooks. The extensive selection of patterns and colors, is bound to have just the right color for your kitchen. In every kitchen, behind cabinet doors, lies a treasure of color just waiting to be discovered. Kitchen carts and bar trolleys have returned to the decorating scene. These vintage-inspired gems are perfect for filling with your colorful mixing bowls, serving platters, and pieces too pretty to hide. When you're stuck on how to add color to your kitchen, try something unexpected: Consider adding color to your soffit, for a bold stripe effect. You can ditch boring neutral blinds for curtains in a striking print. For an eat-in kitchen, mix and match your dining chairs in different colors. If your walls are lacking interest, create a grid of fun Instagram photos printed on mini canvas squares. There is no rule that says we cannot be one of the colorful additions to our own kitchen. Aprons add personality and style in a way that no kitchen accessory can. Choose the color or pattern that you love, and become the star of your own kitchen color story.